Shani is the Best in Los Angeles!! Shani is absolutely the best!!! I went to Shani on a recommendation from a co-worker & now I would never dream of going to anyone else. Considering that waxing isn’t the most comfortable thing to do, I was surprised how at ease I was meeting her for the first time. Two years later, Shani has become an integral part of my routine. Her waxing technique is extraordinary and her knowledge of skin care is phenomenal. From bikini waxing to eyebrow shaping and skin care, Shani is the only choice in LA. The salon is clean and beautiful. Plus, Shani’s personality makes beauty maintenance fun and enjoyable. She actually takes time to get to know her clientele. I have had some of my most relaxing times and some of my best laughs when I’m visiting Shani. Go see her….you are going to love her!!!! Pros: High quality service in all aspects! I had been to some bad places…. That is, before I met Shani. I had been to several different salons and private estheticians all around the Beverly Hills and Hollywood Area and had several waxing nightmares. I was introduced to Shani when I walked in to get my monthly haircut at Capella. Not only was I apprehensive at the thought (of what I assumed to be another waxing nightmare) but I was just plain tired of searching. But, Shani’s professionalism and comfortable environment shock me but her knack for conversation makes it easy to forget that you are actually getting a bikini wax! Needless to say I have been a happy customer for 3 years, and never plan on going to anyone else! From the eyebrows to the bikini Shani is always willing to give her advice and her expertise and gentle touch really make the experience! I started going to Shani because my skin was breaking out and I couldn’t find anything that worked for my skin. Not only did Shani clear up my skin after the first visit, she helped me understand what I needed to do to keep my skin in good condition. She creates a very relaxing environment and every time I see you I feel like a new woman. I get compliments on my skin all the time now. I won’t let anyone else touch my skin except for Shani. She’s amazing! Come to Shani if you want great eyebrows! When I arrived to LA I was on the hunt for a fantastic eye brow shaper. I went to the Capella Salon and was introduced to Shani. Shani specialized in tinting and had suggested that I try it. Well, I will never look back! Not only is Shani excellent at tinting she also has a great sense of how an eye brow should look. Not too thin and not too thick..When my husband came over to visit she also cleaned up his brows without making them look too manicured. Shani is warm and welcoming, she makes you feel very comfortable and you are definately in safe hands. If only I could fly her back to Australia!! Pros: Not expensive, not cheap. You pay for quality. Shani knows the true secrets to beauty! My skin never looks or feels as good as it does post-Shani facials! She’s amazing – professional, beautiful, sweet, and gentle (and a great listener when you need to vent as she smoothes out all the kinks in your neck, head, upper back, and legs). Her makeup is also something to rave about – she made me look fresh and flawless. But her eyelashes have to be the most incredible beautifier you can possibly get. I have brown eyes, and after Shani did my eyelashes, I was getting compliments on my eyes everywhere I went, which is the coolest part: the lashes looked so natural, making my eyes pop, so it wasn’t the lashes that people saw, it was my eyes! (But of course, if dramatic is what you’re after, she’s got something for that, too). If you’re looking for a never-let-you-down, constantly reliable aesthetician, look no further than Shani. Shani is the best anywhere! I have been going to Shani for almost a year now. It happened by accident, as my previous esthetician had left the salon she was working at and gave no forwarding information. I had heard good things about Shani, but had no idea that the other girl disappearing was the best thing that could have happened. Shani is AMAZING! I’ve been everywhere, Aida Thibiant, Burke Williams, Belle Visage, etc, but NO ONE has gotten me the compliments on my skin that she has. She uses the best products, takes her time and has the most gentle touch. Even getting waxed by her is almost pain free. Plus, she has a great personality and always seems to know when your in the mood to talk and when you want to relax and just be. I could go on and on. Shani is the best in L.A, and possibly Southern California. And be sure to try the microdermabrasion. You’re skin will LOVE you for it! Great eyelash extensions. Great everything! Shani is great. She does great work — is concerned about her her clients needs — is easy to talk to — and is, herself beautiful inside and out. When I seek out someone for my beauty needs, I always take note of their own appearance, their skin — lashes — make-up, etc. Although I wouldn’t want to mislead anyone to think that they will leave looking as beautiful as Shani — she will make you look great. I found her when looking for an eyeslash extention specialist and have been going back ever since! Extensions aren’t inexpensive — but Shani makes the expense as painless as possible by offering a one free ‘tune-up’ — and ‘fills’ priced accordingly. If you take care of your lashes, she makes it fairly affordable to keep it up. She also does my brow shaping and no one has ever done a better job. Last but not least — she loves what she does. She never keeps a client waiting and always makes the client (me, anyway) feel like they are her most important one! She is the best. Check her out — you won’t regret it. I have been Shani’s client for years – there is NO one else I would ever trust for my skincare needs. I leave the salon feeling and looking refreshed and invigorated- my skin is ultra smooth in texture and tone and my eyes pop because of her perfect eyebrow shaping job. She recently renovated her room thereby providing he clients with a hip yet tranquil environment. Shani puts me at ease and provides a perfectly relaxing experience when she performs any service. I am looking forward to booking my next appointment, and you should be, too! I’ve been going to Shani since the beginning and I wouldn’t go to anyone else. She’s very gentle and sweet. I get my facials and waxing with her, and now eyelash extensions which I love. 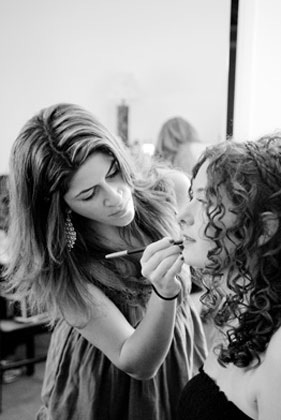 She also did my make-up for my wedding and it looked very natural and pretty. I love Shani and highly recommend her. I have been Shani’s client for years – there is NO one else I would trust for my skincare needs. I feel and look refreshed and invigorated as soon as I step out of the salon. My skin is smooth both in tone and texture and my pigmentation is a thing of the past. Shani perfectly arches my eyebrows allowing for my eyes to pop… I can’t wait to book my appointment with her for eyelash extensions. She recently renovated her room so she provides her clients with a hip yet tranquil environment… soothing music is always playing as she works her magic. Shani is the best! I have been going to Shani for the last couple of years. I’ve tried all the well known people over the hill, paid too much money and nobody was good as her. She is located in a very nice salon in Studio City. I love the atmosphere in her location, she is sweet, gentle and does an amazing job. I would reccomend her to anybody that wants fabulous eyebrows. I travel all the way to Studio City from Beverly Hills ?cause I won?t let anyone else touch my eyebrows but Shani. She?s so nice, and I completely trust her. She listens to what you want and won?t let you leave without being 100% satisfied with your look. It?s well worth the $30 and 30 minute drive. If you are looking for a esthetician or would like to try someone new, I highly recommend, Shani. Her service and professionalism is second to none. She is lovely in every way. I have been going to her since 2003 and have never deviated from her services. Her facials are careful and gentle- perfect for teenagers or men. There is no exceptions with her eyebrows and other waxing services as evidenced by her own. I have always had a terrific time when I see her. I guarentee that you will too!! Shani is the most professional esthetician I have ever met — I have been to many others, and she is by far the most gentle, and most intelligent. It’s a real treat to have an appointment with her — and I never felt before that a facial/waxing was a treat to myself, until I started going to Shani. Her availability is great, the receptionists are very professional, and she has never cancelled on me (which has happened to me one too many times with other estheticians). Her calm composure, trusted judgement, and friendliness makes her the best esthetician I’ve worked with. On top of that, my skin has never looked better. She’s so great at waxing, eyelash tinting, and facials, I wish I could have her do more things for me!! I really trust her work and highly recommend her. I will be keeping her in my network for many years to come. close to home, great skin!!!!! I’ve been going to Shani for skincare and eyebrows for several years, and I cannot recommend her highly enough. She is extremely knowledgeable about skin care and has gotten me through many a break-out and various other dermatological crises I tend to face with my temperamental skin. Whatever the problem, Shani knows how to address different situations based each client’s specific needs. She also does eyebrows better than anyone else I know. Not sure what it is, but she’s the only person who can get them just the way I want them! And because of my sensitive skin, I tend to avoid waxing, but Shani is able to do mine virtually pain and irritation free. I saw Shani yesterday for lash and brow dyeing and i am so thrilled with the results. I have very fine, thin and light eyebrows, but very dark hair, so without brow filler, i look like I have no eyebrows. I’ve had them dyed a number of times, but the resutls always looked like I’d been tattooed – unnatural and quick to fade. Shani’s work is amazing. She made me look like I have fuller, natural brows for the first time in my life. I went to the gym this morning and didn’t have to worry about sweating away brow powder. She also waxed them, which I was very skeptical about but i am glad she suggested it. it really defines my eyes and looks so much more polished. Thank you, Shani. I’ll be making myself a regular! I have been a client of Shani’s for 8 years and I have to tell you my skin looks 10 years younger!! I get compliments on my skin all the time! She does the absolute best microdermbrasions and glycolic peels. She is a very professional and kind person. I always leave there feeling renewed, relaxed and most all my skin looks amazing. I trust her completely. Shani does my eyebrows as well and I would not let anyone else touch them. She is serious about her business and very educated so if you are looking for someone to transform your skin Shani is definitely the best. Going to Shani is always so relaxing with great results after. She uses top of the line products and always cares about your skin before and after treatment. I get my microdermabrasions and facials there that always leave my skin glowing. She also does the best eyebrow waxes and her bikini waxing is fast, clean and oddly a very comfortgable experinece. She also offers eyelash extensions but I have not tried that yet. Go once and you’ll be hooked, I’ve been going to her for years. Shani has been doing my eyebrows for the past 8 years!!!! She is the best woman I have had do my eyes. I moved to New Mexico last year, and tried some new people and they butchered my brows!!!! I actually drove back just for her to fix them. She is the only woman I trust for one of our most important features. Thank You Shani, for amazing talents. Shani is the best. My eyebrows look great, very natural and I always can get in to see her. She is very professional, easy going, and she listens to what you want. The facials are the most relaxing, and she uses the best products for your skin type. The massage is a wonderful plus during the facial, and I always leave completely relaxed. For the first time ever I don’t want to rush home and scrub off all the gunk from my face after a facial. No breakouts afterwards, either. Shani really knows your skin and takes such good care of it! She’s a whiz at eyebrows, too. Add to that, Shani is such a delightful person, it’s a pleasure to spend some time with her. Shani provides a fantastic service, and does so very eloquently. She knows her craft, and delivers what others simply cannot. She makes you feel very comfortable while she works her magic, you will know you are in good hands with her. Great personality, sense of humor, and being easy to talk to, makes it all the more reason to go to her for your needs. She is a true professional and a testament to her industry. She takes away any apprehension I have about getting waxed, and for a guy thatis saying a lot ! Take comfort in knowing she will help you look your best. Pros: Everything! Great eyebrow shaping, clean space, loved it! A trip to Shani is always the best elixir for my body! I continually am thankful for her advice and work. I have been a loyal client for 8 years thus I think I have the faculty to say that she is the best esthetician in Los Angeles. My skin always thanks me after a session with Shani, not only because my hour session with her Dermalogica products have taken me through aromatherapy heaven but I walk out afterwards feeling soft, refreshed, and confident. She truly is a jack of all beauty trades! I went to Shani to get a facial and eyelashes and was very very happy with the results. The salon itself is beautiful and Shani’s room is upstairs…her room is decorated with a chic/modern decor and it is very calming. She makes you feel very relaxed as you lay down on a very comfortable bed with a cozy blanket. The eyelashes came out so natural and beautiful. I get like 2 compliments a day. It is very worth it to get eyelashes because you never have to worry about curling them or putting mascara so it cuts down your getting ready time by half…plus it makes your eyes pop. Her facial was soothing too. Shani is very accomodating and personable. I will definitely come back. After getting a last minute call for an audition (on a Monday evening), I decided to go against my gut feeling and go somewhere else – only because the salon was closed. I had been growing by eyebrows out in preparation to go to Shani but because of the last minute call, I had to go elsewhere. WOW…what a mistake!! Not only did the other person butcher my brows, but I had to pay twice because I ended up having to make an appointment with Shani to see if she could fix the craziness that were my current brows!! She did an amazing job (as always)! I no longer look constantly surprised by the ridiculous arch the other lady created!! I have been going to Shani for over 2 years now for both eyebrows and facials and although I don’t make it in as consistent as I would like, she always does an awesome job!! My skin always glows after her facials and I tend to break out with waxing but Shani doesn’t mind tweezing tmy eyebrows! I’ve learned my lesson…even if I do get a last minute call…I will not go anywhere else!! And because of this experience, I am definitely going to keep my eyebrows in check!! Thank you, Shani!! I finally booked my appointment with Shani for eyelash extensions. I had them done Wednesday and have gotten at least 100 compliments daily since that point. I look and feel like a whole new person! Shani placed each lash on with ease and precision – they look amazing and completely natural. Don’t trust anyone else – go to Shani! You will be sorry if you don’t! Shani Is An Eyebrow GENIUS! I’ve always been terrified to get my eyebrows waxed. I’ve tried it twice before and it was just a little too painful and uncomfortable for me. I heard wonderful things about Shani, so I decided to give her a try. I couldn?t believe how amazing she was! I told her about my fears, and she made me so comfortable and the whole thing was so quick and painless! She was amazing, her room is gorgeous, and overall it was such a positive experience! I never realized what a difference having great eyebrows would make on my appearance. When I walked out of the salon, 2 girls sitting outside of Starbucks complimented my eyebrows, which is something I?ve NEVER been complimented on before! She really is amazing at what she does and I?m definitely recommending all my friends to go pay her a visit. Next time I?ll have to try one of her facials!